46Kam X1 is a completely standalone bike camera system. Everything is built into the camera so there is no requirement for any cables or separate DVR. What does the 46Kam X1 offer? Easy to fit and one touch to record. Features slim line design so is almost invisible when fitted. Can be bike or helmet mounted (both mounts included). Boasting full 1080p HD video, a slim and discreet design, ease of use and a great range of accessories the X1 is a great choice for any biker whether commuting, touring, racing or a keen track day rider. Designed with the British weather in mind the outer shell is moulded from highgrade polymer giving the camera a tough waterproof shell while being lightweight too. Its compatible with all our mounting options and also features a standard 1/4" tripod thread. 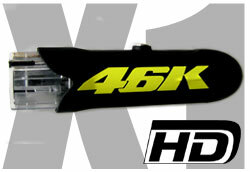 46Kam X1 is small, quick to install and simple to use too at the press of a button. The video footage is recorded onto a Micro SD memory card inside the camera. After filming the footage can be downloaded via USB to your computer or laptop. This will also charge the camera. The X1 can also be manually set up to your own recording prefferances if desired by using the settings file when attached to a computer. This will enable you to adjust many video settings as well as choosing the high motion recording mode at 60fps. The 46Kam X1 comes complete with memory card, pro clip camera mount set (pro clip housing + curved helmet mount & flat bike mount + 2 spare 3M pads), usb download and charging cable, setup instructions and FREE stickers! Bike Camera with Video and Audio recording. 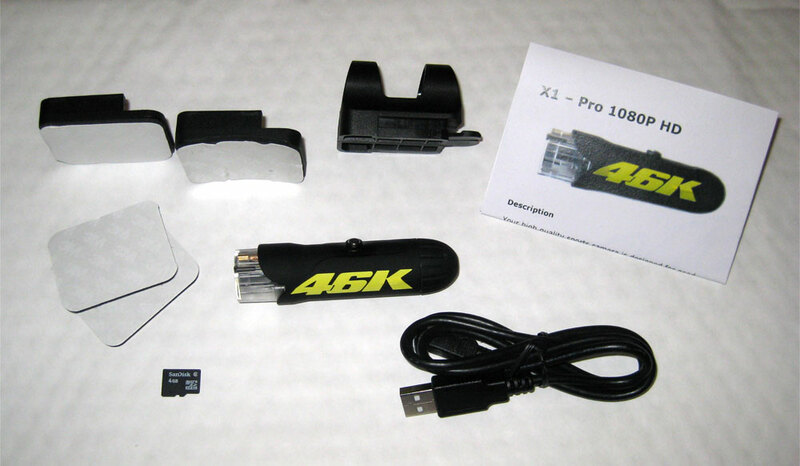 X1 Bike Power Kit (BPK) - Power the X1 camera from your bike! Want to power it from the 12v connection on your bike? These components will allow you to power the X1 from your bike directly and means you no longer need to worry about charging. This system is especially popular for motorcycle touring and those who like to use their camera system frequently. If you have more than one X1 camera fitted get in touch as we can supply a special kit that will run multiple cameras! If you are looking to run your camera for more than the 1.5 hours and want a really easy way to do it then our rechargeable X1 XPower pack is for you! 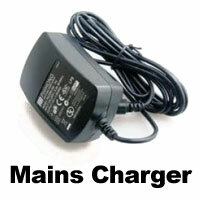 It will supply 12v to your camera and remove the need to keep charging your camera battery. It's supplied with a special adapter for the X1 and is light too, on a full charge the X1 XPower Pack will run your cameras for a good 10 hours. It's easy to use and comes supplied with a charger. A USB charging cable is supplied as standard with the X1 but if you'd like the option to charge it directly from any 240v power socket this special mains adapter is ideal. Our suction mounts are a great way of securing your bullet camera without leaving a permanent mark. Just slide over the camera body and set to the desired angle, for example you may want them on the top of your helmet or the side of your bike. They have been tested to 145mph and will adhere to almost any glossy surface. Mount design may differ slightly from that depicted. They are sold in pairs. A fantastic mount. The 360+ pro clip can be adjusted a full 360 degrees and also angled back and forth to get the perfect angle for your shot. It mounts into a holder and so can be removed if desired. Two Pro Clip holder mounts shown are already included with your X1. 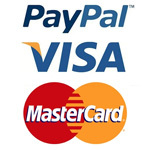 "Certainly can't fault your service and I've no hesitation in recommending your kits"
"Thanks for getting out my order so fast i have to say wow fantastic bit of kit." "The footage quality is fantastic, I’m very pleased with it"
"The video is good and we like the size of it!"